The great eagle has stirred the nest and with that, much of what made it comfortable is gone. Yet, you still cling to the only home you’ve known, refusing to let thorns deter you. The nest still seems very secure compared to the frightening unknown that lies beyond. When your first feeding time passes, you aren’t too worried. But soon it becomes apparent that you’re not going to be fed in the manner you’re used to. After many long hours of waiting, the eagle throws you a very small tidbit, not nearly enough to sustain you. Still hungry and desperate for anything, you pick at some rotting bones in the nest. This strange pattern repeats itself day after day. Then the great eagle comes so tantalizingly close that you lean precariously over the edge grasping for the food. Suddenly, hanging in mid-air, you go tumbling off into the unknown, shrieking and flapping madly. I love the way God reveals himself and his work in our lives through His creation. Yet sometimes, as in the case of the young eaglet, the preparation for his good plans includes circumstances beyond our understanding. And I’m realizing this often means waiting. As I write, it’s been eight weeks now since the official end date of my husband’s probation, yet we are still waiting to receive word about his job. My copywriting business is in an unsettling holding pattern, waiting for clients to come back around with work. What does waiting have to do with flying? Everything, according to our wise Father, the Great Eagle! Apparently, in God’s wisdom and perspective as the one “enthroned above the circle of the earth” (Isaiah 40:22), waiting for him (whether or not we receive the things we long for) should help us venture to the very edge of our nest, take up wings and fly! Waiting is meant to give us new power, perseverance and perspective, allowing us to soar…if our focus is on Him. But whether waiting causes us to fly or flounder spiritually, depends much on our perspective. From the very beginning of time, God has been willing us to wait…in His love, deferring what we long for (even hiding his bigger agenda from us), so that his grand purposes can be fulfilled in our lives. So that we can really fly! I picture Noah waiting in a closed ark for more than 150 days, seasick from stormy seas and struggling to sleep with the pungent aroma of animal waste and the soft weeping of his wife who is mourning those lost through the flood. What will life be like after the flood? Will my family thrive? I see Joseph alone in a dark, dank dungeon of a prison, wondering when and if he’ll be remembered, if he will marry or have children, if he will see his beloved father again. When will God deliver me? What is God’s purpose in all of this? And then there’s Abraham and Sarah who waited for a child (after the promise) for 24 years. There’s Naomi, who after the loss of a husband and sons was so convinced her life was at a dead-end, that she told others to call her Mara (bitter). There were 17 years of preparation between Paul's conversion and his first missionary journey, including three years in Arabia (Galatians 1:17-18). And Moses spent forty years wandering in the wilderness. It wasn’t always clear what God was doing during these interludes. But in each case, God had soaring plans—plans to fulfill His good promises. And it’s the same for you and me! Feeding on self — Thinking we deserve to be “fed” blessings, we focus on what should be given to us rather than learning to fly within our circumstances. Nesting into the world — Wanting the immediate gratification that comes from the world, we medicate our pain and heartache with worldly pursuits. Perching on possessions — Instead of jumping out of the nest, we attempt to build a bigger, prettier nest, filled with the finest of things. Always, always, Satan’s goal is to keep us earthbound…tied to ungodly relationships or worldly goals, motives, pursuits and pleasures, making us think we couldn’t possibly fly. Why would a mother eagle withhold the very thing her eaglet has come to depend on? Because her eaglet was meant to fly. Flying is within the inherent nature of an eagle (more in the next article). Amazingly, being deprived in the short term helps prepare an eaglet for flying. 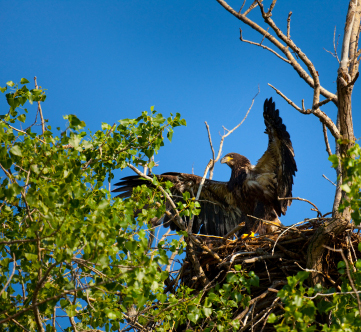 With less food, the eaglet becomes leaner, lighter, more flight ready. By the time they either fall out, get shoved out, or make the jump, they’ve been uniquely equipped. Likewise, I’m convinced that as a child of God, I was never meant to be earth-bound, earth-satisfied or earth-fulfilled. Tests, trials and hardships all are a part of God’s good plan to help me soar spiritually. But first, he needs to get me flight ready. I see a glimmer of this in our life story. I waited 24 years for Dave’s deliverance from sexual sin. But those years brought amazing healing to my own losses and a transformed relationship with God. And now the Purity Restored ministry is changing lives. After hatching a dream to write a book, God had over 12 more years of tests, of trials and of precious lessons in mind, before he opened the door for Secure in Heart. Now God is using the book as a pathway of hope for so many. And in my husband's life, I still see this. Because I needed time away, 20 years ago Dave needed to give up the full time ministry for secular work. Although he's served his company with great zeal, he's always had the heart for so much more. Yet financially, we need his income. And so we wait, looking to the Lord. Here's what I need to remember. When God holds back a blessing I long for, it's not meant to taunt me, or show me that I'm not good enough yet (or that other are more worthy), rather it's meant to teach me how to take up wings and fly! Waiting, trusting and consecrating ourselves to His good purposes are all important parts of the journey to a secure heart. Go on to part three of this series — Flying Forward. Ask Yourself: How does waiting help make us lighter and leaner, more flight ready? What have you had to wait on God for? How have times of waiting prepared you to receive God's blessing? Apply: Read James 5:7-11. James warns that grumbling can be a temptation in times of waiting. Write down two or things that you are currently waiting for. How are you tempted to grumble? Say a prayer to surrender those situations to God's compassion and mercy (v.11).